The Shito Ryu school of karate was founded by Mabuni Sensei. Mabuni Sensei had trained under two of the greatest masters of Okinawan karate: Ankoh ITOSU (Shuri Te) and Kanryo HIGAONNA (Naha Te). Out of respect for both his senseis, Mabuni Sensei took characters from their names to form the name for his unique school of karate, Shito Ryu. 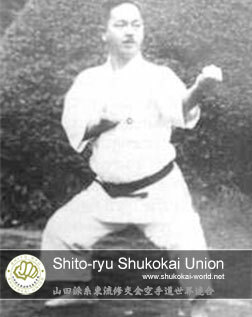 In developing Shito Ryu, Mabuni Sensei incorporated both the Naha Te and the Shuri Te systems together with katas from the Chinese White Crane system (known as Wu Xianhui) that he had learnt from the legendary Go Ken KI, a Chinese tea merchant who lived in Okinawa at the time. In 1929 Mabuni Sensei left Okinawa for mainland Japan and settled in Osaka. The Shukokai school of karate was founded by Tani Sensei. He began his study of karate at junior high school practicing Goju Ryu and continued his training at the Doshisha University in Kyoto where he studied under Chojun MIYAGI, the great karate Master (who was the founder of Goju Ryu and who had trained under Higaonna Sensei). Later when Sensei Miyagi returned to Okinawa, Tani Sensei trained under Kenwa Mabuni. After the Second World War Tani Sensei started to teach Karate in an open air car park in the centre of Kobe. His group (Shukokai) soon grew and one year later he built his own Dojo attached to his house. Born 1938 in Akita prefecture, Master Yamada began his martial arts study in Judo before becoming involved in Karate. 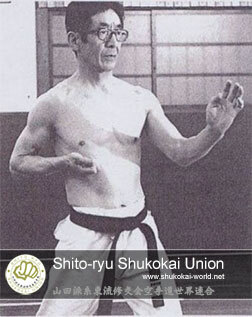 In 1956 he became a disciple of Master Tani and was one of Master Tani‘s top ranking pupils. Master Yamada inherited the Presidency upon the passing away of Master Tani, and is also the Chief Executive of Gishinkan, a Shukokai drill hall based in Amagasaki City, with approximately 10.000 followers nation-wide; mainly in the Kyoto/Kobe/Osaka districts. Master Yamada runs a renowned bone settling clinic. 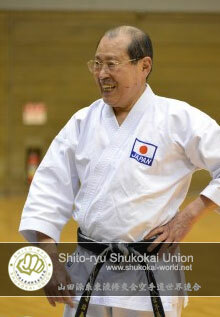 Born 1950 in Saga prefecture, Mr. Kamohara began training in Karate in his early days at Osaka University of Economics. In his fourth year at the college he was made Osaka University Shukokai Kumite Team Captain. The team comprised some very famous Shukokai stylists including Yoshinao Nanbu and Ryozo Tsukada. In the early 1970s, Mr. Kamohara travelled to England as a member of the Japanese team for Karate competition against England. Shortly afterwards Mr. Kamohara returned to Europe, and was based at the European Shukokai Headquarters in Brussels. Mr. Kamohara later moved to France further promoting Shukokai, and is now based in Chartres.